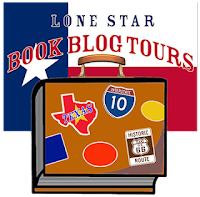 Hall Ways Blog: Dr. Arthur Spohn ~ Lone Star Book Blog Tours Promo! Dr. Arthur Spohn ~ Lone Star Book Blog Tours Promo! Number of Pages: 352 pages. 78 b&w photos. Map. 4 Appendices. Index. 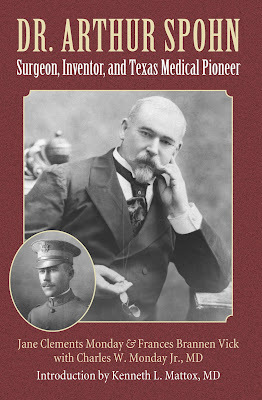 In this first comprehensive biography of Dr. Arthur Edward Spohn, authors Jane Clements Monday, Frances Brannen Vick, and Charles W. Monday Jr., MD, illuminate the remarkable nineteenth-century story of a trailblazing physician who helped to modernize the practice of medicine in Texas. Arthur Spohn was unusually innovative for the time and exceptionally dedicated to improving medical care. Among his many surgical innovations was the development of a specialized tourniquet for “bloodless operations” that was later adopted as a field instrument by militaries throughout the world. To this day, he holds the world record for the removal of the largest tumor—328 pounds—from a patient who fully recovered. Recognizing the need for modern medical care in South Texas, Spohn, with the help of Alice King, raised funds to open the first hospital in Corpus Christi. Today, his name and institutional legacy live on in the region through the Christus Spohn Health System, the largest hospital system in South Texas. 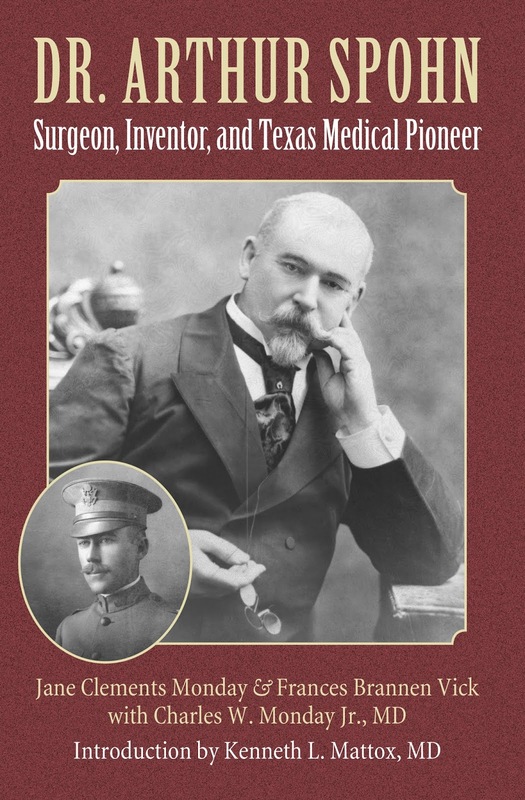 This biography of a medical pioneer recreates for readers the medical, regional, and family worlds in which Spohn moved, making it an important contribution not only to the history of South Texas but also to the history of modern medicine. The chapters in the book are mesmerizing...the photographs in the book are priceless and probably cannot be seen by the general public except in this book. This is much more than a biography of Dr. Spohn and his medical triumphs. It is a book about life in South Texas from 1865 to the 1920s and beyond. Dr. Arthur Edward Spohn was part of that history and his contributions to medicine and the development of South Texas have guaranteed his legacy for years to come. This book is the proof. This is no dry medical text. Even if you have little interest in the medical field, you'll be astonished at the life of this accomplished physician and surgeon. JANE CLEMENTS MONDAY is the author of numerous books and coauthor, with Frances Brannen Vick, of award-winning Petra’s Legacy: The South Texas Ranching Empire of Petra Vela and Mifflin Kenedy and Letters to Alice: Birth of the Kleberg-King Ranch Dynasty. She has served as chair of the Texas State University System Board of Regents and mayor of Huntsville, Texas. She resides in Huntsville. FRANCES BRANNEN VICK is the author or coauthor of numerous books, including Petra’s Legacy and Letters to Alice. She founded E-Heart Press and cofounded the University of North Texas Press. Vick has served as president of the Texas Institute of Letters, the Texas State Historical Association, and the Philosophical Society of Texas. She resides in Dallas.